Summary: The author offers five compelling reasons for teachers to write for publication, including the opportunity to understand our teaching practice and to inform the public. This brief article would work well as a resource for educators who are beginning to explore writing about their work. The article could be sent in advance of a professional writing retreat as well. Teaching practice is part of a complex system within the universe of education. Like change in any organic system, a thoughtful shift in any facet of practice impacts everything else. But how does one get inside teaching practice in order to study it and in order to change it? Sylvia Earle, internationally renowned marine biologist, recently worked with some of our writers. She told her story of trying to change the “culture” of the way people study the seas. The whale, for example, had been studied only from the surface of the sea. The tail of the whale is its thumbprint, by which scientists know one from the other and track them from place to place. But who would know how they nurture their young, how they look and sound within their own environment and their own culture? With the courage of any explorer of the unknown, Earle dove with the whales. Writing for publication about practice thrusts the writer through the surface to the deep water of professional practice. Practitioner-writers swim through stages of awareness and discovery from the first moment when they consider the dive. They see students, colleagues,parents, the school in new ways. Writing groups become vehicles for probing more deeply. My partner Joseph Check, Director of the Boston Writing Project, and I did not know this when we first joined with other practitioners to create a journal where teachers’ voices could be heard in the educational arena. Now, nearly ten years later, we have found that practitioner-writers supported over time, from idea to publication, often plumb the depths of their work. Through this medium, they see and understand their own practice in new ways. Writing for publication about practice is like diving with whales. Traditionally, schools and classroom teaching have been studied from the outside looking in. While this is one valid way of knowing education, it is from other perspectives, closer to the heart of learning, that writing about practice gains its value. The teaching self is not static. Each of us is in a continual state of evolution. Daily experiences, including current reading, writing, viewing, and interaction with others, modify who we are in the classroom. Writing to reflect on practice creates an interior dialogue, an awareness that we do not function in isolation. In addition, we come to know what every historian knows: that the very recording of experiences creates questions and casts perspective on what happened. Every time I write about my work I take it and myself more seriously. In sorting through my experience, I uncover value in my teaching, my collegial relationships, and in my own capacity to make sense of the things I’m involved in. In my head I am extremely self-critical, to the point of frequently doubting my ability to contribute to my learning community, my school. As I write about my work, though, it looks better to me—not, I think, because I write with rose ink, but rather because I ultimately write more objectively than my spontaneous mind thinks. I make up stories and exaggerate all day long in my head. Somehow in writing my heart begins to balance the harshness of my mind and I can get closer to truth. Of course, sometimes I write things that aren’t true. But the grace of writing is that it lingers to be looked at again, and I can come back with renewed integrity or fresh perspective and capture what’s real. The archetypal writer—let’s make her a poet—has always been the seer, the one who is more sensitive to the world around her, who says what needs to be said for others in similar situations. Through writing, the practitioner gains a heightened awareness of professional practice as she intends to share that practice with others. Even as the writer prepares to share experiences and learning through text, however, the dive deepens through the medium. The process of reflecting and choosing language to capture experience provokes new discovery.”When she…begins to perceive the close relationships between language thought and reality in her…transformation, she will see the need for new forms of comprehension and, also, expression” (Freire, 1985, p. 22). In order to communicate with each other, with our students, and with parents, teachers need to become clear about who we are and what we think. The complexity of our work often hides like a sea creature at the bottom of the ocean’s deepest trenches. Initially, writing about practice seems fairly straight forward, but the process of writing complicates things. Only when we begin to see below the surface do we discover the complexity of our own practice and the possibilities within it. A year ago I attempted to write a chapter for an intended book about professional development. I was a teacher on leave of absence working with the professional development team at the Annenberg Institute for School Reform, a national school reform organization at Brown University. My chap­ter was to be about teachers’ changing practice. I had decided to write a personal narrative that included both my voice and the voices of practicing classroom educators. As soon as I began to write, a seemingly simple question blocked my progress: What is my practice? The question opened unexplored areas which led to more questions. I became stymied in murky waters. The progress of the chapter slowed to a stop. Recently I completed an article which was an attempt to sum up several years of work with various colleagues on peer coaching. As always the writing nudged me toward a kind of clarity; about what I’d learned from my experiences. To convey to others the importance of something I felt passionately about, I needed to get clear about what I was saying, shed much of the ambiguity; inherent in such complex work….The writing helped me to achieve a greater clarity, but as I used that new clarity as a lens to process continuing experience,I realized that conclusions achieved through writing suddenly became just the first step in a new learning. Boldly, teachers must now use their stories for a new purpose—school reform. If schools are to change for the better, teachers must use their stories to analyze their best practices and discover their core values. Schools do not change under the pressure of mandated rules and policies. Rather, schools change through a combination of forces from within and without. Changing that culture from within must begin with an awareness of our own stories and how they contribute to the culture of schooling. I had been sharing my teaching since I started back in Michigan in 1973, working in teams every year but one, and that had never seemed particularly risky. It always felt natural to work with others. Carolyn, Letty and I have been teaching partners for better than 10 years. During that time we have developed the kind of collegiality Judith Warren Little writes about; planning units and lessons, co-teaching, reflecting on our work. We trust each other enough to talk about all aspects of our practice and often ask each other the hard questions….But this was different. I was asking my partners to read a draft of an article that I was writing, and for the first time in our professional relationship, I was nervous about sharing my ideas with them. Well, not exactly ideas­ those we had been sharing/or quite some time.And it wasn’t just that I was sharing my writing, although as a novice writer, I still find it a bit scary to have others read my pieces…So what was the difference?…For the first time I was attempting to describe several of our co-teaching sessions and had included my own attempt to make some sense of what had happened. My dilemma was that while we often talked about our work, there was, in a corner of my mind, a chance that my attempt to write about it for publication would change our relationship…is it worth taking the chance?…Apparently it was, as the writing was shared and the learning that resulted from our conversations about that piece have helped us all improve our practice. By the time Hole and his team members joined with others to form a Critical Friends’ Group at Narragansett Elementary School, they had already gone public with their work through Hole’s writing. Without hesitation they stepped forward to model observation and “public” debriefing.His team member Letty Mills said during one of those early debriefings that her lesson is always better when she is being observed. She said, “It is not because I am better prepared but that I am better focused. A change occurred within myself. It is as though I am two people in my classroom. One is teaching, the other observing through the lens of my focus question.” Writing about practice creates that same dual role: the writer is both practitio­ner and critical observer. Traditionally, teachers work in isolation. They plan lessons alone, teach alone, feel success alone, and sometimes agonize alone about why a lesson or a class did not produce the learning intended. Coming out of isolation broadens the possibilities for teaching and learning. In a sense, teachers who work together move to a more public arena with their work. The tension teacher-writers face is first to define the word ‘harm.’ Silva and her colleague, Edorah Frazer, wrote a controversial piece about an experience with the evolving career ladder/portfolio system at their school. Silva applied for career advancement through the portfolio process; Frazer sat on the board. Before the process began, the two decided to write about it from their individual perspectives. To preserve the integrity of the process, they agreed not to talk until a decision about Silva’s advancement had been ren­dered by the board. The painful initial denial of Silva’s application thrust the two into unexplored personal and professional territory. During the editing of their writing intended for publication, they negotiated with each other, as well as with administrators and faculty, to find grounds for common understanding and progress in this revolutionary and very important project. Teachers interested in changing school culture may be inspired by the work of Paolo Freire. Freire writes about his educative theory and practice with South American peasants living and working within an oppressive system. In order to assist them in trans­forming themselves and their culture, he first used stories relevant to them; then he asked them to tell their own stories. Once told, the stories became texts for learning, for analysis and action. The storytellers and their peers learned to question both their own assumptions and actions as well as those of their overseers. Freire calls this a “crack” in the silence of a society. Telling the story is a liberating act. Through this “pedagogy of the oppressed,” peasants learned to ask “Why?” and, in so doing, embarked upon the process of transforming both the self and the culture. Teachers and students become co-learners in the pro­cess of inquiring into and decoding the stories. Themes for study emerge. Good stories beg for climactic moments or subtle turn­ing points. According to David Tripp in his book Critical Incidents and Professional Judgments, a critical incident is an occurrence in our daily practice that we hold up for examination by isolating an incident, writing about it in detail, analyzing it and exploring its significance. Criti­cal incidents become tools for carefully looking at the quality of professional judgments and at the assump­tions underlying those judgments. Through these and other tools, writing groups in schools can beg:in to explore issues of common concern and may serve as turning points in changing practice. Both Freire and Tripp advocate using our own stories as text to inquire into ourselves and our culture. Such texts for learning place the teacher in the position of learner. They create a dialectic about what is and what might be. And they create a model for critical thinking and dialogue for our students. I’m always hoping that if teachers write more they will share with their students their particular struggles to get the words down ‘just right.’ Imagine what a difference it would make if students were exposed to dozens of such adults over the course of their school going lives. At CPESS Meier created a culture of intellectual dis­course as a strategy for running the school and as a model for students. She is vehement in her belief that we cannot teach students to debate issues in an in­formed manner if we do not model that behavior on a regular basis in faculty lounges and in classrooms. I get curious reactions to my writing from colleagues. Articles about education bring brief, “I liked it” kinds of comments. When I gave about thirty poems I wrote this year to a dozen or so teachers, their responses were awkward and surprised, as if the openness of poetry had somehow broken rules of distance in the profession. Only my students seemed able to ask real questions and make some good comments, perhaps because my class is always putting the heart and the head in contexts for sharing. Veterans model for neophytes in the world of work. Physicians serve as models for interns, judges for clerks, mentor teachers for student teachers and soon. Through the process of writing about practice, teach­ers retain their vulnerability as learners, sensitive to the complex challenge of putting thoughts into words. Writing is a humble act during which the writer is always up against personal inadequacy. Sharing this struggle with students models genuine learning. Writing about practice for an audience is very differ­ent from journal writing. It is also very different from writing about someone else’s practice or about educa­tion at large. The practitioner who writes from per­sonal practice looks inward through a process of reflection upon practice in relation to students, subject matter, colleagues, and sometimes the system within which the work occurs. At some point toward revi­sion for publication, the writer looks outward, sometimes with trepidation, at who the audience might be, within the school or beyond. As a reader, the writer knows that good writing will have impact. Sometimes for the first time, the practitioner-writer realizes that writing about practice is a political statement. Such narrative explications have the effect of framing the idiosyncratic in a ‘lifelike’ fashion that can pro­mote negotiation and avoid confrontational disrup­tion and strife…the conditions by which differences in meaning can be resolved by invoking mitigating circumstances that account for divergent interpreta­tions of ‘reality’ Gerome Bruner, Acts of Meaning p. 67). Each of us sees reality from a different perspective. Through writing for publication about practice, prac­titioner/writers learn to tell a story to a particular audience in a particular way. Personal narrative has powerful potential to link the school to the commu­nity. Through stories about practice we can create an un­derstanding between writer and reader. Most educa­tors, like most members of the general public, were schooled in traditional ways. It is hard to imagine schooling without basal readers and students seated quietly in rows. By writing for publication about changing practice, they can include the public in their own search for improved schooling. Writing our stories about practice seems, in a very complex way, to be one way to immerse ourselves in our practice, a way to plumb its depths through another medium. On a literal level in Sea Change, Sylvia Earle tells her story of trying to change the “culture” of the way people study the seas. She dives with whales. One moment, all I could see was a massive black head, 15-foot-long flippers, a grapefruit-sized eye, then, in a mountainous blur of motion, she swept by, miracu­lously avoiding contact by inches. In a sense Earle became a whale. Inside the dramatic moment, she experienced a shift in perspective about her own role in the underwater community. Throughout her career Earle has been an explorer and caretaker of the sea and vocal advocate of reform. She dove with whales to understand them and tried to get to the ocean bottom to prove her own ecological theory. To get to the bottom, Earle founded a com­pany to build a deep ocean-diving vehicle. 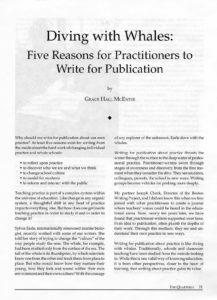 Writing about practice for publication is one way for practitioners to dive with whales, to sit in a deep ocean diving bell to explore the depths of their own teaching practice. How do we dive with whales and plunge deeper into the canyons of our practice to see it in a way that we have never before seen it? How do we change our practice to protect and nurture the fragile life, the very vitality that supports our organic sys­tem? Like Earle’s diving bell, peer editing and writing support groups allow writers to dive deeper than they could alone.Writers see the world of teaching practice through new eyes and, with the help of others, dis­cover what may have been hidden in the darkness. Back on the surface, they prepare their stories for an audience of their peers and for a wider readership. All practitioners benefit from writing about practice. Whatever the level of expertise or experience with the written word, those who dare to write for an audience see their own practice through their new critical eyes. Sharing both during the revision process and in the eventual published piece provokes change in indi­vidual practice to meet newly recognized challenges. So, how, finally, can we help steer the course of events…? One solution is simply to improve one’s own self and work toward a better society; within existing institutions. (Mihaly Csikszentmihalyi, The Evolving Self p. 280). Writing about practice for publication is a medium for understanding individual practice from the inside. When we join with others in the diving bell of that inquiry process, we may discover what has been hidden in the darkness and what may be crucial to new life in our collective classrooms.